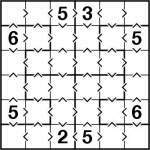 This entry was posted by Gareth Moore on December 4, 2009, and is filed under Inequality Sudoku, Jigsaw Sudoku, Samurai, Samurai Variants, Sudoku, Sudoku Variants. Follow any responses to this post through RSS 2.0. You can leave a response or trackback from your own site. I completed these. I didn’t enjoy the Samurai one as much as I wanted to. I think the argyle pattern the arrows made with the normal boxes caused my eyes to hurt. I am not going to try the Samurai Star Inequality one until I finish the Inequality Sudoku in Xtra #1 that has no given numbers either. I need the practice. I have also completed these two. I found the first one very easy, the second much more enjoyable. Inequality sudoku is a variation I don’t often do as I normally find them very difficult and don’t always have the patience required to painstakingly note down all possible numbers. Because of the large number of arrows however, this one filled in quite nicely with numbers discovered quick enough to maintain interest. Now to have a look at the Samurai Star although I don’t hold out much hope…. I have now completed these two and found them both enjoyable. I particularly enjoyed the Samurai, due to the easier level. 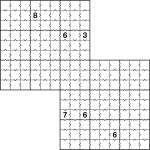 It was a pleasure to complete two grids in less time than I would normally take on a standard inequality! Now for some punishment with the Inequality Star!